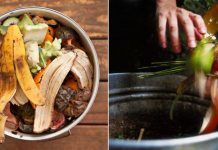 Learn How to Use Coco Peat in Garden in this informative guide to encash some amazing Coco Peat Benefits for plants, proven in research. It increases aeration, water retention, improves soil texture, productivity and reduces root diseases! Coco peat is a growing medium and normally used for soil amendments. It’s made from the husks of coconuts. It’s a beneficial product for plant growers and provides an alternative growing medium. It’s used much like sphagnum peat in garden applications. It increases water retention, aeration and provides antifungal benefits when used alone or incorporated into the soil as an ingredient. Peat moss is not a sustainable gardening resource. It’s a product of peatland mining, which is a hazard to environmentally sensitive swamps and bogs. Here’s an educative article to read, regarding this issue. Coco peat is an alternative to peat moss. Moreover, it’s better than peat moss because its superior in water retaining capacity, wettability, drainage, aeration and is also more resistant to diseases, pests, and weeds. Coco peat can be put into use in many areas such as in greenhouses, seedling nurseries, worm bedding, hydroponics (Growing medium), application in horticulture and floriculture, container gardening, etc. It is free of weed seeds and sterile. It has neutral soil pH. Peat is acidic. It has better moisture retention and aeration capability. Read this study at Research Gate. It provides resistance against root diseases. Check out this research! It is slow to decompose as compare to peat. In the end, check out this study in which different growing mediums were used for growing cucumber. Highest production was observed with perlite-coco peat combination. The coconut fibers have been ground and compressed in bricks. The bricks are easy to package, market, store and handle. The product will need to be reconstituted before using. Coconut coir or peat comes in compressed form, it expands and increases up to 5 or 6 times in volume after it’s reconstituted. Only break off the amount you’re planning to use. Break apart a brick in parts and throw it in a large bucket. Add enough amount of water to saturate the brick. Allow the dry coco peat to sit in the water for some time so that it can become loose and absorb the water. Stir and fluff coco peat with a garden trowel after 10-15 minutes, add more water if it looks dry. Stop, if it’s loose. Stir and fluff again after a few minutes to make sure all of it has been moistened, add more water if it’s not loose yet. 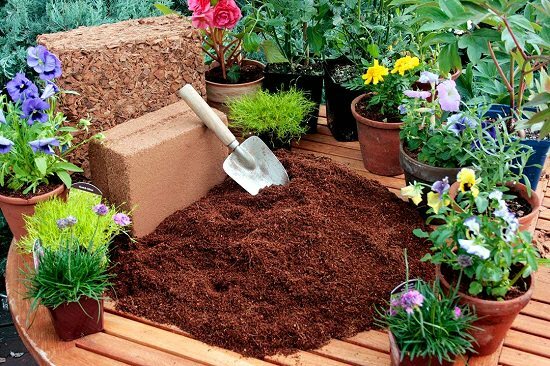 Once you see the moist and loose coco peat, it is ready to use in the garden. Coco peat can be directly incorporated into the garden soil to improve water retention, aeration and decrease the risk of the soil fungus and root diseases. Mix in soil at 25/75 ratio. It can also be used as a mulch around garden plants to help the soil retain moisture and prevent weed growth. 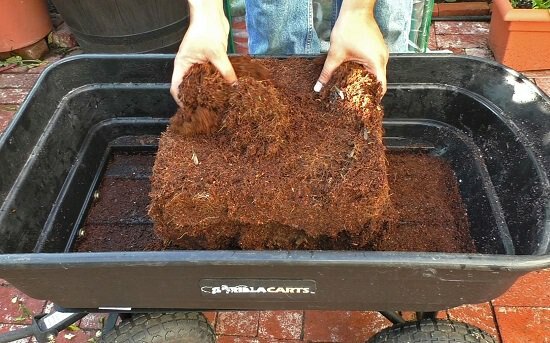 Coco peat can be used as a soil-less growing medium for potted plants or in aqua-culture growing environments. Add the reconstituted bricks to planters, leaving 1 inch of space below the planter rim. Plant a seed or seedling in the center. Fertilizer and soil will need to be added to sustain a plant long-term when it’s planted in coco peat. If you don’t know how to use coco peat in pots–the way is to add a 1/4 part of coco peat in the potting mix. Container gardens dry out faster, so apply a 1-inch layer of coco peat over the container soil to help the soil retain moisture. Coco peat can also be as a sole growing medium for starting seeds. Once the shoots start to form you can transplant seedlings into the pots.